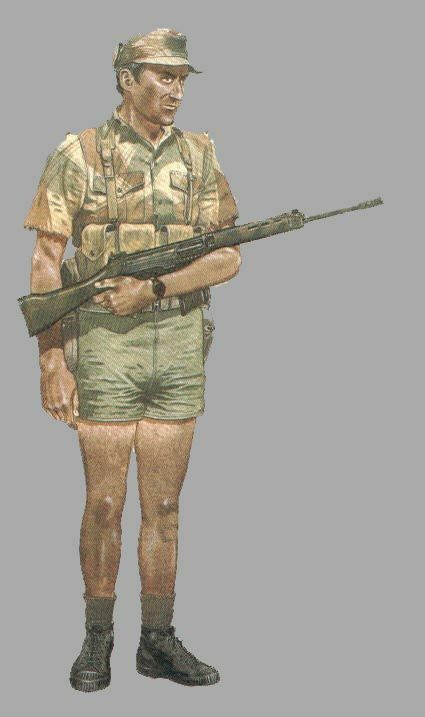 DPM is pretty close to rhodesian brushstroke in appearance and is dirt cheap, just take one and replace the British flag with a rhodesian one, for the shorts cut the legs off of some olive drab pants and resew the hem. Also grow your beard out and grow your hair out a little bit but not too much for the selous scout look, and get an olive drab or DPM boonie hat. Get a deactivated airsoft FAL (G3 or AK would also work) and paint it in the rhodesian color scheme and get a chicom chest rig. Allmadeups makes reproduction Rhodesian Chest rigs and backpacks. Add some brit pattern 58 webbing for the canteens, and that will get you 90% of the way there .